This seems harmless enough until you consider that the user in question is Savannah James, wife of LeBron and mother to their two (soon to be three) children. As you may have heard, LeBron has opted out of his contract with the Heat, and if he leaves Miami, one of the possible destinations in free agency could be Cleveland. The Cavs are the odds-on favorites to land him. Those odds are only going to increase in light of Savannah’s post. Here’s where I should mention that I am from Ohio, so I have a vested interest in seeing LeBron return to his home state. OK? OK. The caption strikes me as calculatedly cryptic, to the point where it’s only logical to interpret Savannah’s tribute to Northeast Ohio as a message regarding her husband’s free-agency plans — plans that will largely be determined by the James family’s wishes. If you truly love a place, it goes without saying that you’d prefer to live there for more than three months out of the year. LeBron: "The decision comes down to me and my family, at the end of the day. If my family is happy, I'm happy." Of course, basketball will factor into LeBron’s decision as well, and a roster of Kyrie Irving, Jabari Parker or Andrew Wiggins (presumably), Tristan Thompson, and a slimmed-down Anthony Bennett looks a helluva lot better in the long term than whatever ragtag bunch of misfits the Heat will have to offer. Business interests are also important, and wouldn’t you know it, Browns quarterback Johnny Manziel is represented by LeBron’s marketing agency, which is headquartered in Akron. The facts speak for themselves, people. 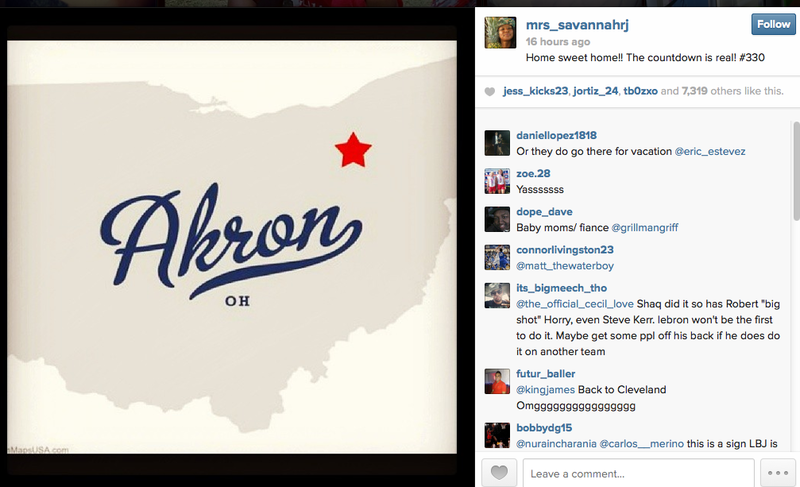 On its own, a mere Instagram post wouldn’t serve as incontrovertible evidence of LeBron’s next move. But in the context of a world where LeBron was expressing interest in rejoining the Cavaliers just two months after “The Decision,” this definitely means something. Throw in the fourth estate, basic laws of karma, scripture, brotherhood, illuminating quotes, THIS PARTY, Grantland darling Chandler Parsons, and the natural desire to improve one’s legacy, and there’s really no question as to which team is best positioned to end up with LeBron. The countdown, as they say, is real.